Whilst California Girl was chatting with the general manager and taking pictures of bottles in the vineyard, on the hottest day of the year so far, I was hard at work. My job was to taste the wine. Don’t tell California Girl, but I think I get the better half of this deal. 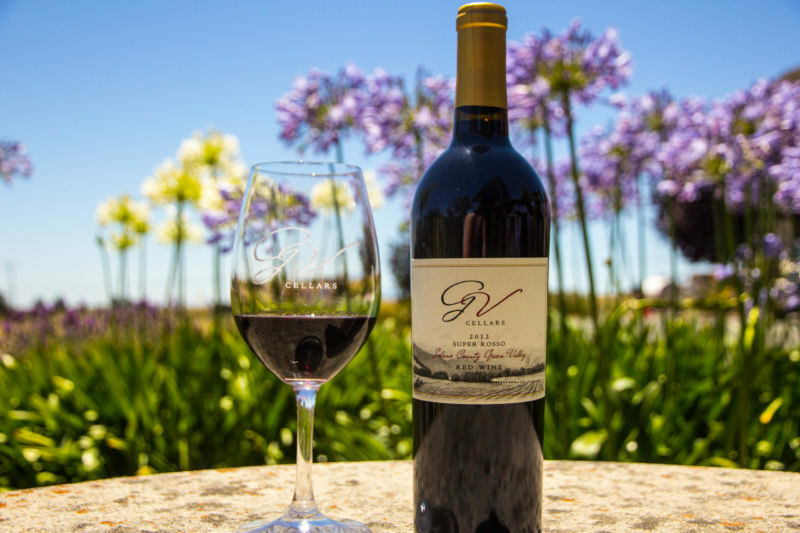 California Girl Comments: It was gorgeous in the vineyard shooting the wine, but it was hot. I did have a nice glass of wine, or possibly two, to keep me company and to ensure I was nice and relaxed with the camera. It is an unoaked wine, using grapes from Lodi. It had a very pale color; unsurprising given the use of stainless steel in place of oak. On the nose I detected melon and honeysuckle. There was low acidity. There was a clean, citrus taste, which was somewhat impaired as the wine was served over-chilled. This was the third time in three days that I had tasted a rosé using this grape. The colour was a very light pink. The nose was an overwhelming odour of strawberries. It was a light, crisp blend of strawberry and melon; an ideal summer drink. California Girl Comments: I managed to get a sip of this one between shots. I agree with The Brit on the strawberry aroma hitting your nose. The wine was soft and light and I really enjoyed its flavor. I would love to pair it with salmon, or shrimp. The grapes for this are all estate grown. The colour was a medium purple. The nose was a mix of berries and damp earth. 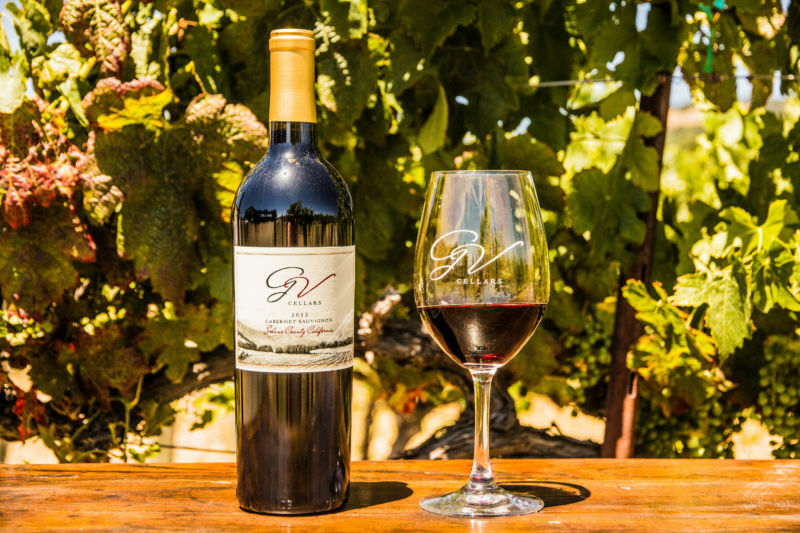 The low to medium acidity was balanced by a long palate of dry smokiness and berries. The grapes for this are from the five acres of Dolcetto grapes on site. 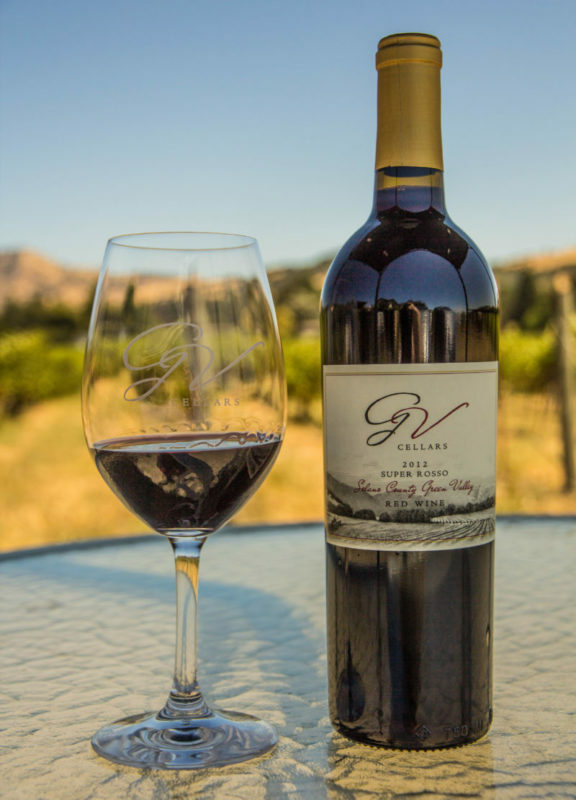 GV’s small planting of this grape represent 5% of the total in California. The colour was a dark, rich purple. I smelt raspberry and tobacco. The wine had low acidity. The taste was of sweet mixed berry and a subtle earthy aftertaste. This was our favorite of the tasting and we purchased a couple of bottles. The name Dolcetto can be confusing to anyone with familiarity with Italian menus. Dolce means sweet and is used to describe desserts. It is, therefore, not unreasonable to assume that a wine called Dolcetto would be sweet. It is an Italian grape and its name translates as “The little sweet one”, but the wines made from it are generally dry; the name probably refers to its relatively low acidity. 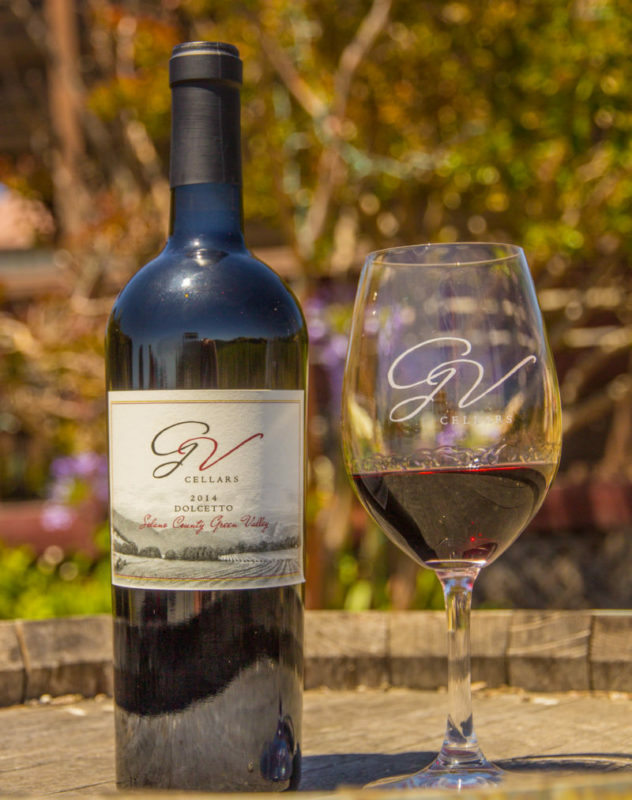 California Girl Comments: I loved this wine; approachable and full of flavor. I felt like it was a magical hybrid of Pinot Noir, Malbec and maybe a Sangiovese. I loved its price too. The colour of this was not the dark inky hue that one expects from Cab. On the nose I smelt blackberry and raspberry. There was medium acidity, which combined with the dry finish muted the fruit tones. This is not yet ready for drinking. Give it a couple of years in the cellar to mellow and mature and you will have a nice bottle in this one. 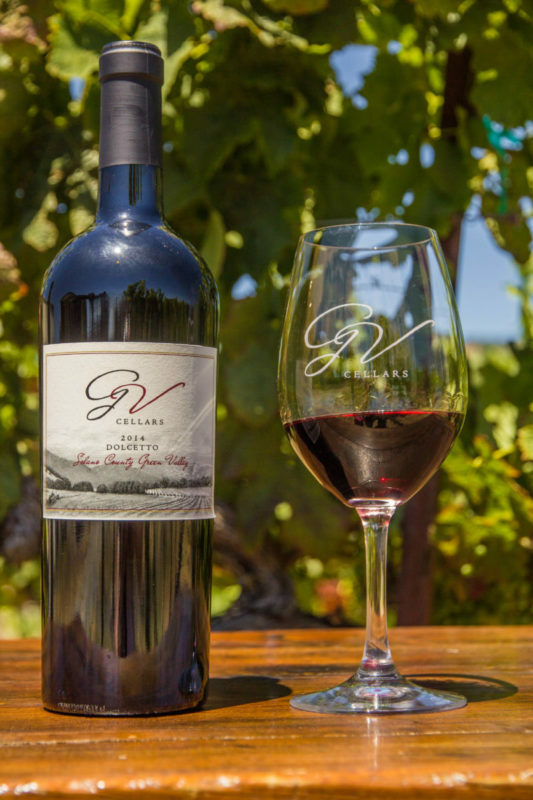 This is Tuscan style blend: 56% Sangiovese, 27% Syrah, 17% Cabernet Sauvignon. The wine was a medium-dark purple colour. There was medium acidity, which with a soft, understated dryness suggests that it would pair well with rich dark meats. There is a wealth of fruit, with raspberry being the most distinct. California Girl comments: This is another in the lineup that I enjoyed. It is a nice version of an Italian style red blend. I would pair this one with a nice bowl of pasta with fresh tomato and basil. I think I may have to sample more of this one to fully form my food pairing ideas. This is a Cab/Syrah (60/40) blend that, as the name implies, is emulating an Australian wine. The nose certainly lived up to my expectations of the style; a big explosion of redcurrant and blackberry. The taste did not match the nose; the dryness masked the fruit. This was my least favorite of the tasting, but the nose still offers promise. It will be interesting to revisit this in a year to two. 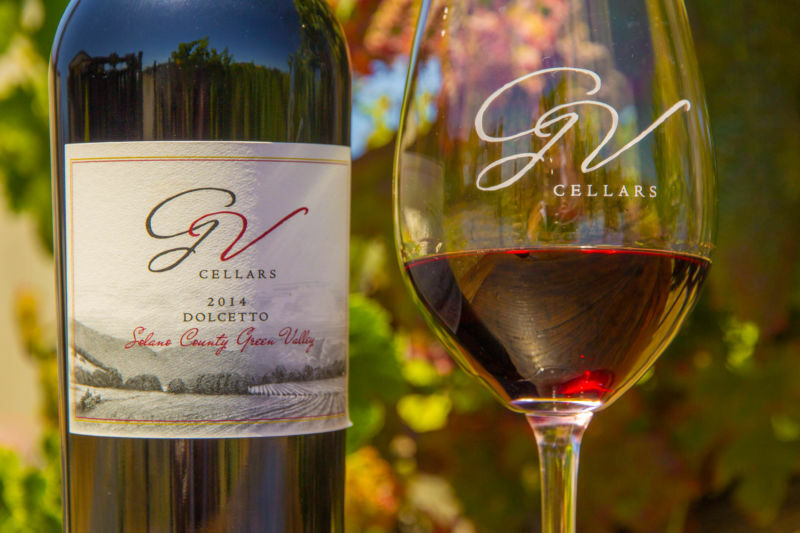 Give Away – 2014 GV Cellars Dolcetto!